Casey is our 1 ½ year old Golden Retriever. Our son is an only child and had been asking for a dog since he could speak. Finally, when he turned 10 we thought this might be the perfect time to get a dog to be a companion for him. 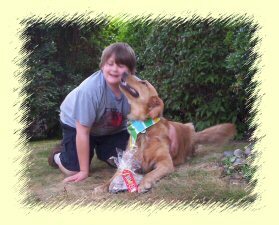 Our son saved up his money and in February 2005 he had enough money to buy a puppy. 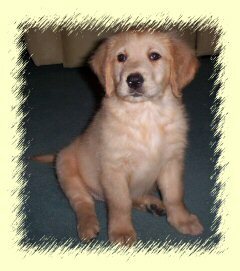 We considered many different breeds and settled on a golden retriever. When we went to see the puppies I was taken aback at the size of the parents. They were huge!! Once we saw the puppies we were sunk. Rather than our son choosing a puppy, Casey chose him. She went right over to him while the other puppies ignored him and played with each other. It was love at first sight and we brought Casey home in a strawberry box. She was adorable. When we got her home, we put some paper down and she went right over to it and peed. We thought “What a smart puppy!” Shortly after that she wandered over to the carpet and pooped. We thought, “She is just confused and missing her mommy”. Well, in the days that followed our lives were turned upside down. Paper training was going so, so, we had gone through several bottles of carpet cleaner. Casey decided chewing on the paper she was supposed to be using to go to the bathroom on was great fun. She began chewing on everything, including us. Within 3 days, my son who had begged us for a dog for so long was in tears. He said “Mom, I am so sorry, I think we made a mistake, I had no idea puppies would be so much work!” I too was wondering if we made a mistake. 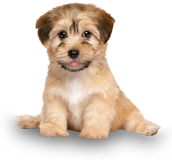 I wondered, “How can such a little puppy create such chaos in our home!” I started talking about our situation to people. After a couple of days I got tons of advice. The problem was that everyone had a different opinion on the proper way to raise a dog and so far, none of the advice I was getting seemed to work. Casey was still peeing on the carpet, chewing up things and our hands and feet looked like pin cushions! We took her out for walks and she pulled us around and was constantly eating all sorts of things off the ground. We had to keep a very close eye on her for fear she was going to eat something that would make her sick. Despite our vigilance, she managed to eat something (we still don’t know what) that made her very ill. A $500.00 vet bill later and I was starting to feel pretty desperate. I knew she was going to grow up to be a very big dog and if she could cause this much chaos as a puppy, I could just imagine what things would be like when she was full grown. I knew someone who has a golden retriever and had always been impressed at how well mannered her dog was. 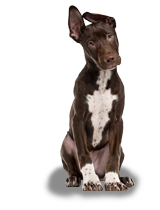 I spoke to her about our situation and asked her if she knew any obedience classes that might help us. She said “Well, there are lots of places out there but the best is Sit Happens.” I thought that was a pretty catchy name and looked up Sit Happens on the All About Dogs website she had told me about. I called Jeff and talked to him about our situation. He was very knowledgeable and told me they had an in home training program for puppies (Casey was too young to socialize with other dogs yet). He reassured me that he could help teach us how to train Casey. He suggested we not make a decision until we saw him demonstrate the results of his training method. He came over to our home and we were blown away when we saw how well behaved and obedient his dogs were. Casey loved Jeff right away. She still goes “gaga” whenever she sees him. He obviously has a gift for working with and connecting with dogs. We signed up for the in home training program and the next week Sit Happens came to our house and started teaching us how to train Casey. I was shocked at how quickly things turned around. Our house was no longer at Casey’s mercy, nor were we. We were finally enjoying this cute little thing. We were so impressed with the training that when she was old enough we joined the outdoor training program. I love the flexibility of this program. We just went to the website and picked a convenient time and place for a lesson. In addition to being convenient, the lessons were fun! I began meeting other dog owners and it became a weekly social outing for us. I was so impressed at these lessons to see dogs of all shapes and sizes all behaving so well and learning so quickly. Between lessons on every walk we would practice what we learned. We used things in our neighborhood such as stumps and manhole covers to practice sitting in place and so on. Jeff taught us to build on Casey’s natural instinct to retrieve. She loves to put things in her mouth so Jeff suggested we teach her to fetch. 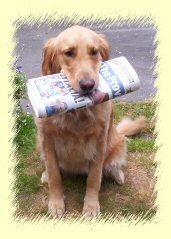 She now brings the newspaper in for us every morning and when the mail comes she brings the letters to us one at a time, wagging her tail happily. When company comes she brings them an offering in her mouth. Now, rather than chewing things up destructively she fetches them to us. It was not long before Casey was ready to go on walks off leash. I began getting comments from people about what a well behaved dog she was. She was not dragging us around the block any more, walks became a pleasurable, relaxing experience with Casey right by my side every step of the way. Our son took part in the training too and Casey who used to ignore him and chew on him now listens to him obediently and plays with him gently. Casey even heels beside him when he rides his bike and they have races with one another. She has become a true friend and companion. 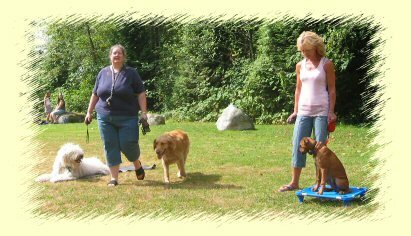 After a few months Casey had mastered the outdoor obedience program and Jeff suggested we might want to try the Rally-O classes. We have just finished a set of lessons and Casey won a 2nd place prize at the fun tournament held the last day of class. I still can hardly believe it and I am still so impressed by Jeff’s teaching methods. 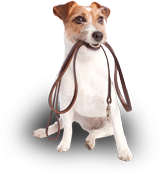 I am amazed to see all the dogs at class being so obedient, having such good relationships with their people and learning so fast. Dogs that have had trauma histories or who have been aggressive or ones like Casey, all seem to respond in such a positive way. I have absolutely no hesitation in recommending Sit Happens. It was the best decision we made regarding Casey, I have absolutely no doubt that Sit Happens can help any dog owner help their dog become the best friend they ever had.